Incumbent Ken Wilson, who is running for his second term on Boulder City Council, has great ambitions, and says he’s determined to make Boulder an overall better place to live. After serving on the Boulder City Council for one term, Wilson’s many accomplishments have strengthened the Boulder community. Currently, Wilson is the Deputy Mayor on council, which simply means the mayor’s right hand man or substitute when the mayor cannot attend meetings. He holds other responsibilities, as well; the greatest among these is helping set the council agenda during the weekly Council Agenda Committee meetings. Ken Wilson took part in two major projects that stand out: the West Trail Area Study (an Open Space management issue) and the council initiative to reduce greenhouse gas emissions from rental properties (Smart Regs). The Open Space Management project looked at the portion of Boulder’s 40,000 acres of land in the West TSA area to determine the balance between recreation and preservation. 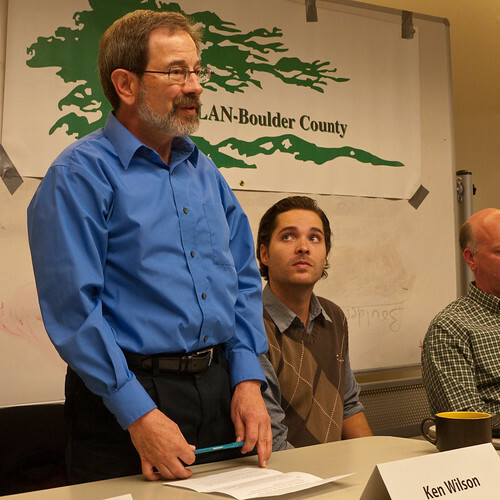 Wilson worked with other council members, the Boulder Outdoor Coalition, and Friends of Boulder Open Space to decide what would best suit the land: recreation or preservation. Wilson studied biology in CU’s Department of Ecology and Evolutionary Biology from 2005 through 2009. “I studied with Professors Steve Schmidt and Tim Seastedt to learn something about microbiology, ecology and the environmental impacts of climate change. Ecosystem management is very important for our Open Space, we have to really look at the science of what is happening,” says Wilson. Wilson says he, along with the other council members and members of the public, worked hard to maintain balance on Open Space lands, providing good trails that will lead to better preservation and thinking about impacts on the natural communities of plants and animals that we want to protect. Wilson considers Smart Regs to be one of the most important projects that council has passed in the last two years. This initiative will help increase energy conservation in rental properties. Wilson worked behind the scenes with the Boulder Area Rental Housing Association to help craft regulations that will encourage energy conservation, save money for renters, and give property owners an ordinance that can be implemented in a reasonable manner. “I am proud that I was able to provide the rental property owners with ideas and suggestions on how they could make their concerns heard and get a set of regulations that are workable,” said Wilson. The Smart Regs program met its 2011 goals and Wilson is hopeful that the more aggressive 2012 goals will be met as well. One of Wilson’s other areas of concern is bike safety. “With increased bike riding in the city, we have seen increases in bike/car accidents and in bike/pedestrian accidents. We need to pay attention to safety through education and enforcement.” Wilson says that education is especially needed for University of Colorado students to help bike and pedestrian safety.